Discover The Best Way To Enjoy A Soothing Massage… Where We Come To You! Adelaide Mobile Massage is a proudly South Australian owned and operated business with over a decade of experience in expert massage services. Unlike some of our competitors, we have personal contact with all our therapists locally and employ the very best fully qualified massage therapists. As our name suggests, we come to you. This includes your workplace, home, or a specific event. During a busy workday, a mobile massage service can save you a lot of precious time. It is far more convenient than having to battle through busy traffic and find a place to park. This is a huge benefit in itself. 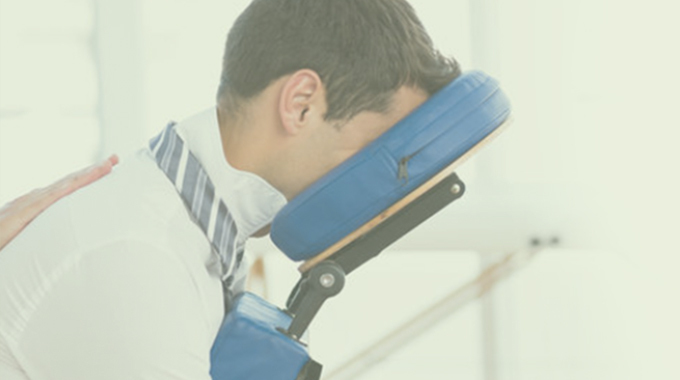 So whether you are looking for a relaxing massage, or suffering from headaches due to stress, or requiring treatment to recover from a sports injury… our unique massage service will ensure you feel much better quickly. Need a more productive team? Give your guests a better experience! Want to relax at home in comfort & peace? Do your residents need some loving attention? We have been having visits from Adelaide Mobile Massage since 2014 and at all times have found the service to be professional and easy to deal with. It has been a pleasure to get to know Carla - she is friendly, punctual and delivers a very relaxing massage experience. Feedback from our staff is always positive. We have Adelaide Mobile Massage visit our office in Eastwood on a Friday afternoon every month. The therapist is always punctual and easily sets up in our boardroom. My team looks forward to their massage session. They block out the time in their diaries and when somebody is away they almost fight over who will take up the extra time! Mobile Massage is a simple and inexpensive way to give something relaxing and enjoyable to staff at the end of the week. After the massage session, we like to retain that relaxed feeling, by opening some drinks and reflecting on our week together. As part of our Wellbeing Program, Phil Hoffmann Travel arranged for staff at our 10 locations to receive a massage. As I am based at our Glenelg Head Office, I was able to see the staff come out from the massages received from Alan and Carla who worked hard to relieve the stress and tension. The relaxed look of our staff after receiving the massages was precious. Adelaide Mobile Massage is a fantastic reason to indulge your staff and your students! That's right we use them annually as a stress breaker for our hardworking year 12 students. I always book them just before the trial exams and the students love it! But the staff love it more as it is recognition of their hard work!!! The team always arrive ready to go with a can do attitude. They engage with the students and staff and create a relaxing and welcoming environment - even on the busiest of days. Easy to organize and always willing to make the experience work this company deserves recognition for service. Lock them in - you won't regret it. Thank you so much for your professionalism in helping USASA deliver UniTopia. All of your staff were exceptional and students had a wonderful time. "My husband and I both had massages this afternoon with Alan, it was one of the best massage experiences we have encountered! Cannot wait to re book! Thankyou again. " We just had a massage with Alan and just wanted to say how good he was. He was very professional ,and we both feel great after he came to our apartment and did it in the comfort of our our place. The massage was so relaxing and beneficial as he also loosened and worked gently on muscles. My husband had a deeper massage as he is a professional runner. We organised a massage for my 89 year old mother and I wanted to say a very BIG THANK YOU to Anne, the therapist. She made Mum so very relaxed and comfortable because she was so caring and considerate of her delicate skin. AccessPay are a long term client who have a couple of masseurs visit our workplace every six weeks, to provide shoulder massages to our staff. The team at Adelaide Mobile Massage are always friendly, professional and our staff look forward to their regular onsite visit. We highly recommend their services to anyone looking for a reliable and quality massage team. Adelaide Mobile Massage are a fantastic service that play an integral role in helping the students of UniSA unwind, refresh and enjoy at our UniTopia events across the year. I’ve had the pleasure of working with a variety of the masseurs and all of them have delivered an impeccable service and experience for students. If you are looking to reward your staff or to incorporate massage in to your next event, look no further than Adelaide Mobile Massage. Mick and Andrew really like Arie and he makes such a special effort to connect and chat with the gentlemen – we are all very impressed, and both men are always extremely relaxed after too which is lovely for them. The professional approach, quality service and flexibility offered in meeting our specific requirements have made Adelaide Mobile Massage a most welcome inclusion to our staff wellbeing activities. The massage therapists that have visited us are expert, respectful, and attentive practitioners who have provided a relaxing and soothing wellbeing experience that all staff value highly and look forward to. Rob and Carla are amazing – everyone was thrilled with their massage – I cannot thank you enough. We will certainly be involving you again. From the first contact you have been professional and accommodating. Well done, an absolute pleasure to work with. Mobile Claims Team, RISK INSURE PTY. LTD. Wanting to reward our staff Risk Insure invested in the services of Adelaide Mobile Massage and nearly 12 months on we can not recommend Adelaide Mobile Massage high enough. The high calibre of service and skill is what makes Adelaide Mobile Massage stand out. Risk Insure finds the Adelaide Mobile Massage team friendly, efficient, flexible to our work environment and accommodating to our requests. If you are looking for a team incentive or thank you to your staff or even yourself, Risk Insure highly recommend the service and price point that the Adelaide Mobile Massage team offers. We look forward to many more relaxing and therapeutic massages. Thank you Vanessa and staff for the weekly massages you have provided to Vero Insurance for the past year. Each Wednesday the staff eagerly await the arrival of your staff and have a great feeling of relaxation after their 10 minute session with most staff wishing the 10 minutes could go for that little bit longer. Your staff are friendly and approachable and most importantly, good at what they do and it has been a pleasure dealing with Adelaide Mobile Massage. I highly recommend your business. Thank you again. Hi there! Just wanted to thank you very very much for the wonderful massage we received from Stephen and Erin. They were wonderful and patient. Please send them our thanks and well wishes. It was fantastic service and I will definitely recommend you to anyone wanting a top quality mobile massage service. Many thanks again. The massage went extremely well. Feedback from those who participated has been excellent. We will definetely keep you in mind for future events and future directions in early intervention strategies. Organised as part of our state’s “Wellness Program”, the corporate massage sessions by Adelaide Mobile Massage proved to be the most positively talked about and remembered component we’ve offered so far. Being a new experience to our team, they were surprised at how relaxed and stress free they felt after a massage. They went back to work with a new lease on life! We used Adelaide Mobile Massage as a part of our Health and Well-being week. The staff were extremely professional and friendly which made everyone feel comfortable as this was something we had not had within the workplace before. Thank you so much, and I highly recommend this to any business to reward and relax staff and we will be using again! We have had a busy and event filled few months at Crosby Dalwood and I decided to surprise the team with a massage each this week. It was just what we all needed. Narelle spent most of the day in our offices and she was very friendly and professional as well as being an expert Massage Therapist. The team at Adelaide Mobile Massage responded very promptly to my emails and last minute booking request. It has been a pleasure dealing with your business. We will definitely be back in touch when next we need to de-stress. Thank you. Adelaide Mobile Massage was a great way to reward our team after a hectic few months of a marketing campaign. All team members greatly enjoyed the experience with the only regret being how quickly the massage time passed! Highly recommended. Thankyou for providing such a professional service to the team here at Hilton. Everyone thoroughly enjoyed the 15 minutes of time away from their desk. The office seems very calm this afternoon. Jackie was an amazing masseur and very polite and respectful. My staff were very grateful for the massages provided. They came at the end of a busy time for them, and they truly appreciated the relaxing neck and shoulder massage that helped them to feel better. Thanks so much for the punctuality, the equipment set-up and the great masseuse. excellent service! Thank you to the wonderful team at Adelaide Mobile Massage for a day of pampering in the workplace. 21 massages over the course of the day and every staff member commented on how professional the masseuse was and relaxing the massage was. We will certainly look into using this great service again, one very happy workplace. "The massage was very through, discovered sore spots that I never knew existed, Pierre also knows his stuff. " "Pierre was great, professional and very worthwhile as he really gets into the problem places and loosens up the knots. If the time was a little longer it would be very beneficial, however, it is a good time to just loosen things up." "Pierre was lovely, great masseuse, would recommend him, 20 minutes was a good amount of time." I would like to thank all of the people at Adelaide Mobile Massage. Absolutely brilliant service from beginning to end. I received a reply to all of my queries immediately when I emailed. I then received a swift reply with my remaining questions. The massages done on all three of us at Powerhouse International were absolutely brilliant. Receiving the separate invoices for us to claim on our private health is such a good idea. The process was so easy. The massages were well priced and we are all VERY happy customers. Thank you so much. 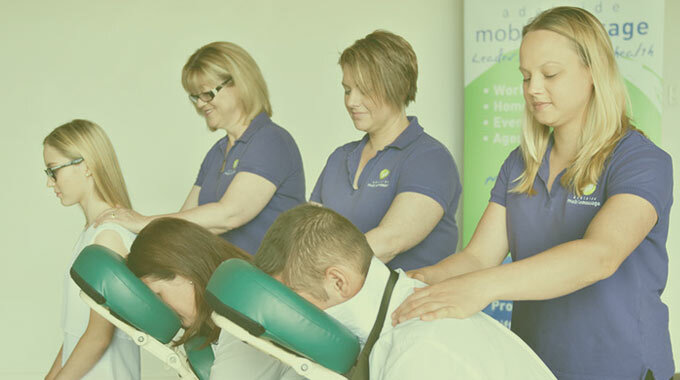 After seeing the Adelaide Mobile Massage promotion last year, I kept their contact details and booked in early ready to treat our fantastic SSOs to 15 minutes of de-stressing and time out away from their busy roles. Every single one who participated loved it! I wish I had scheduled in a 15 minute slot for myself. A great way to show appreciation to our hardworking para professionals at our school. I am sure we will use AMM again. "The massage was fantastic!! Pierre was also great and made you feel comfortable. It can be weird when a stranger has to touch you hahah but he was good at breaking any awkwardness! He also had tips and stretches and explained what the issue was which was great!" ~ "We have done a vote and we think Pierre is the best remedial masseuse that we have had!!!" ~ "I had stress knots but Pierre fixed them- so good and so relaxing at the same time." ~ "Exactly the right pressure used- what a great massage!" I would like to let you know that every one of my 6 staff loved the massage from Pierre yesterday. He was an expert, listened to our needs and ensured everyone enjoyed the experience. A true professional. The HIA in Hindmarsh would like to take this opportunity to thank “Adelaide Mobile Massage” for a recent visit to our office. We had 20 staff who were fortunate enough to undertake a 15 minute neck and shoulder massage and everyone was very positive about their experience. The masseuse was extremely professional and organised and all contact with “Adelaide Mobile Massage” leading up to the day, was very promptly received. We would highly recommend any business wanting to give their staff a treat, to book Adelaide Mobile Massage.